Early, but afterwards perfectly intact cluster are hung on threads to wither for at least three months, with partial presence of noble rot. Produced with care and patience, Ikòn is a Passito wine designed by time to reach a sophisticated and elegant taste. Soft and wrapping, Ikòn holds a consistent smell of citrus, candies and exotic fruits. Ikòn is produced by the vineyards in Serra de’ Conti, in a mixed consistency soil, tending to sandy, with southeast exposure. After about a three-month period of withering in cellar, it gets pressed, softly and slowly. The must obtained is fermented in steel tanks and involves a maturation period of two years in small wooden barrels and one more year in bottle. Colour: Golden yellow with strong amber reflections. Perfume: Intense scents of citrus, candies, exotic fruits and elegant tertiary aromas. Flavour: Pleasantly sweet, warm, wrapping, of great softness and consistency. On the palate, the same notes perceived by the nose are discerned: exotic fruit, peach and ripe apricot integrated with spiced notes and a largely persistent honey aftertaste. Excellent to go with desserts, from dry pastries to almond-based cakes, “cantucci” biscuits or dark chocolate. Thanks to its properties, it can be paired with even stronger flavours like, for example, blue or spicy cheeses and fois gras. On its own, it is very agreeable as a meditation wine. 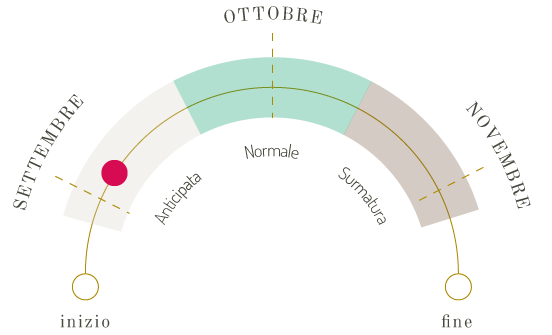 This type of harvest usually occurs at the beginning of September, with the aim of producing wines characterised by optimum freshness and acidity.